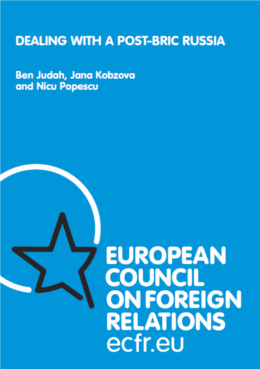 Jana Kobzova is an associate fellow at the European Council on Foreign Relations. Her research interests include the EU’s foreign policy towards the Eastern Partnership countries and Russia, as well as democratisation and transition in the post-Soviet space. Kobzova is based in Brussels, where she works as a policy director at Rasmussen Global. Before joining RG, she worked as a senior programme officer for an international NGO, the European Endowment for Democracy, where she oversaw the organisation’s programming in the Eastern Partnership region. Before moving to Brussels in September 2013, Kobzova was a policy fellow and coordinator with the Wider Europe programme at ECFR’s London office, where she wrote policy reports on the EU’s relations with its eastern neighbours and Russia and worked on increasing ECFR’s profile in the area and expanding the Wider Europe programme’s activities. Between 2006 and 2009 she led the Belarus democratisation programme at the Pontis Foundation in Slovakia. Kobzova has an MA in Politics, Security and Integration from the School of East European and Slavonic Studies at University College London and an MA in Political Science from the Comenius University in Slovakia. 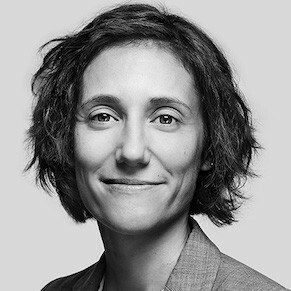 She has co-authored several books on Eastern Europe and the EU’s eastern neighbourhood policy and continues to write about the subject as an associate fellow at ECFR. Monday’s violent protest outside the parliament and the departure from the coalition of the Radical Party have kicked off Ukraine’s hot political autumn. The EU should stop rewarding its eastern neighbours’ promises and anchor its aid on reforms delivery. A new era for EU-Georgia relations? While many Ukrainians still want to join the European Union, foreign policy plays a much smaller part in this vote than the Western media thinks. Three pieces by ECFR's leading Wider Europe experts on the current situation in Ukraine, Putin's appeal for a new world order, and Germany's crucial role within the EU. The time has come for the EU to rethink its relationship with its biggest neighbour. Instead of talking about strategic relations with Moscow, the EU should consider a strategic pause. 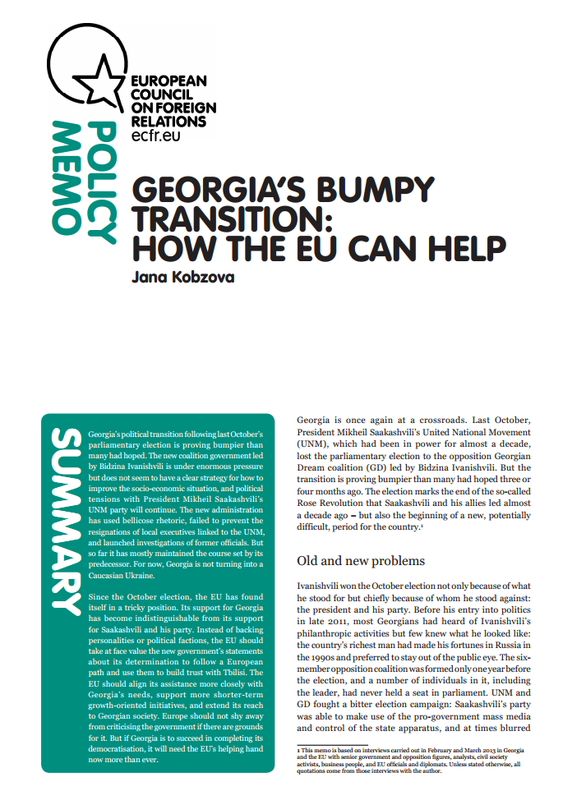 Jana Kobzova on the current state of the European Union’s policy towards its Eastern partners. 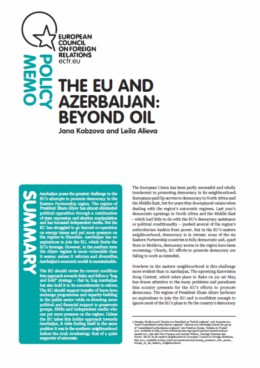 Jana Kobzova writes on relations between the EU and Eastern Partnership countries ahead of the EaP Summit in Brussels. The article mentions two commentaries by ECFR experts Managing the Unmanageable: Germany and a Resurgent Russia and Western solidarity with Ukraine: Do it yourself. TVP INFO in a TV programme "Studio Wschod" broadcasts Nicu Popescu's commentaries and other conclusions of the ECFR conference in the context of the crisis in Ukraine. Jana Kobzova comments the new Georgian government's policy during the seminar organised by ECFR Warsaw. Jana Kobzova asked about the EU's commitment in the Polish - Russian case of returning wreck of crashed airplane. Jana Kobzova comments on the dashed hopes for a Russian bailout for Cyprus.